Savage Sword of Conan #1 Review – AiPT! An action-packed pirate adventure continues to prove Marvel has a major hit on their hands. Conan the Barbarian has come back to Marvel and in only three issues it has been made clear the character is in good hands. Jason Aaron and Mahmud Asrar have done an exceptional job capturing the episodic nature of the series while developing a new overarching story. 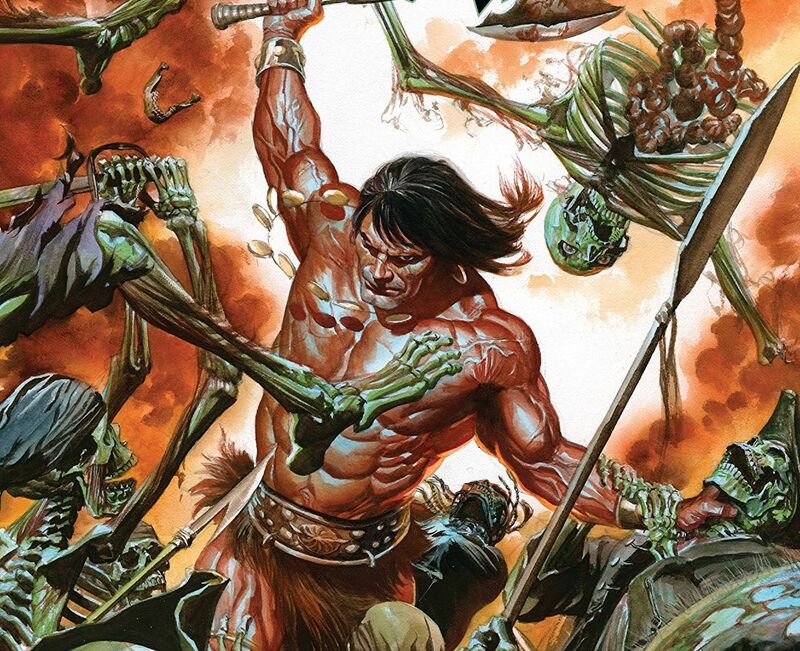 With the groundwork laid by Marvel, it’s time for additional Conan comics, and thanks to Gerry Duggan and Ron Garney Savage, Sword of Conan is coming this week. The five-part story starts tomorrow, but is it good? It’s easy to forget a big part of Conan is the sorcery and monsters in play. Typically we think of the character as strong with but a sword, but it’s his wits and his inability to give up that proves to beat even the most formidable beast. This issue shows that and more. I was expecting a bigger sword! This issue has every staple of Conan the Barbarian and then some, making it quite easy to enjoy for longtime readers. Gerry Duggan does an exceptional job drawing the reader in at first, opening with Conan drinking with a pretty lady with a fire roaring. As you turn the page you realize he isn’t eating fine meat, but a raw shark. It sets the stage for an adventure that is stacked against Conan and it’ll take all his luck and fortitude to come out alive. This is a miniseries, so it’s fun to see how Duggan fleshes out a key supporting character as well as throw a lot at Conan to overcome. If the main series showed how Conan is almost unfailing, this issue shows how Conan can endure even the worst situation. The pirate theme works well for this character and it’s fun to see how Duggan and Garney integrate sorcery. There’s even a vision to be had, which is a fine element of the series as a whole and fun to see integrated here. This issue also comes with a conclusion of sorts, giving it an episodic feel that is satisfying, but with a promise for more when the story ends. Garney brings a darker tone with heavy use of shadow and blacks to place Conan in a figurative pit of hell. It’s only the hull of a ship, but it’s about as bad as it can get for him. In a key double page layout, Garney gives snapshots of Conan recouping with black panels between captioning the struggle. There are also some awesome extreme close-ups on Conan that capture the rage of the man is only a snapshot of his face. It’s a powerful moment in the story. When things go from real to monstrous, Garney captures the horrific nature of a monster very well. Colors by Richard Isanove are subtle but rich, maintaining a realistic look even when flame is concerned. There are swords wielded in this issue, but not the type you’d expect. I was a bit thrown off by the slower pace of the story, which focuses more on his struggle than an all-out battle. It’s a great issue, but the title and cover suggest a much more action-focused affair. Marvel’s return to Conan continues to be an instant hit. Duggan and Garney are capturing an adventure style of the character with a mix of monsters and magic that is not to be missed. Marvel's return to Conan continues to be an instant hit. Duggan and Garney are capturing an adventure style of the character with a mix of monsters and magic that is not to be missed.